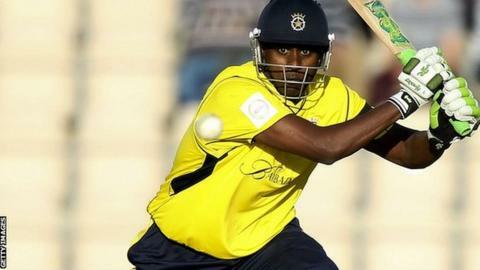 Hampshire all-rounder Dimi Mascarenhas says he will be fit for Hampshire's Champions League qualifying campaign which starts next week. The 34-year-old missed the CB40 semi-final and final with a shoulder injury, having bowled through the pain barrier on T20 finals day in August. But Mascarenhas says he plans to try out the shoulder in nets on Thursday. "I'm very confident it's going to be okay," Mascarenhas told BBC Radio Solent. Hampshire qualified for the tournament for the first time after winning the English T20 competition in August. New Zealand side Auckland Aces and Pakistan outfit Sialkot Stallions will be in Hampshire's qualifying group in South Africa, with the winners going through to the Champions League proper. Mascarenhas also plans to have a gentle run out in a pre-tournament practice match in Johannesburg on Sunday. "I want to play the practice game but only go 70% or 80% to make sure its good," added Mascarenhas. "After that, that's enough to be confident of being ready for the first game."